Learn how to use OmniFocus alongside complementary productivity apps to navigate your day with grace and ease. 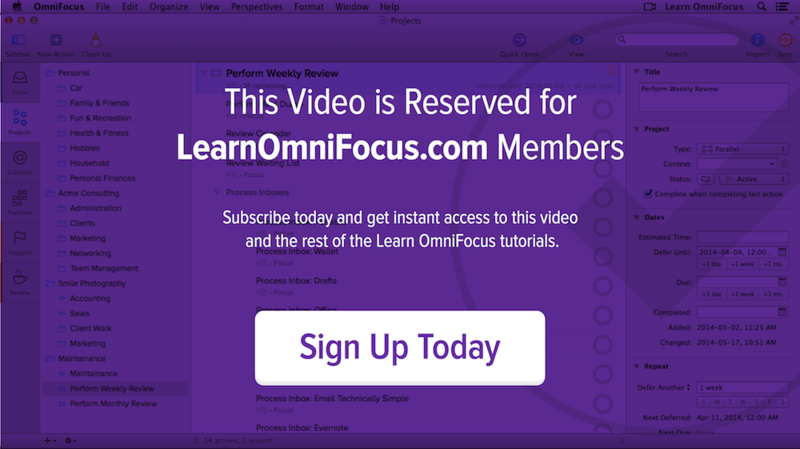 This session builds on the foundation of Creating Structure in OmniFocus 3. You'll learn how to leverage this structure and practical ways to be intentional and focused as you bring your actions and projects to fruition. The session places a strong emphasis on starting the day on solid footing and provides practical strategies for dealing with the unexpected activities and interruptions that may show up as you go through your day. It also provides guidance for performing mid-day and end-of-day reviews that help maximize your productivity and learn from your experiences. We explore some apps that are a natural complement to OmniFocus. Featured apps include Apple's Calendar app, Fantastical for Mac, and the Focus app by Masterbuilders. Using OmniFocus to home in on the actions that are most relevant, even when there are many things that you could be doing in any given moment. Applying the Threefold Nature of Work principles that are included in David Allen's Getting Things Done (GTD) approach to productivity. Going beyond dealing with urgent, time-pressing actions in favour of making progress on important tasks that will ultimately improve your quality of life and work. Using the estimated duration feature in OmniFocus to help ensure that you're being realistic when planning your day. Using the Apple Calendar app and Fantastical for Mac to block off time for your OmniFocus actions and projects. Using the Focus app by Masterbuilders to help you focus and make progress on your most important OmniFocus projects and actions. Dealing with and minimizing interruptions. Capturing the learning from your day, with some help from Timing for Mac, RescueTime, and the built-in Screen Time feature of iOS. Creating custom perspectives that help you quickly change gears as the need arises. Performing routine actions that help keep your life and work on an even keel. Threefold Nature of Work — This session includes an overview of an element of Getting Things Done (GTD) called the Threefold Nature of Work. Read this article by David Allen to learn more. Brain.fm — Brain.fm is a service that plays "Music for the Brain". Among other things, playing this audio while you work can help enter into and maintain a strong state of focus. They have a free trial available so that you can see if it works for you. We'd be curious to hear your impressions. Total Time — The Total Time AppleScript, that was written by Dan Byler, allows you to add up the estimated time of all of the selected items. You can download this and other scripts by Dan Byler here. And you'll find this and other scripts in our OmniFocus AppleScript Directory.